On Saturday, Malacañang disputed the claim of Senator Antonio Trillanes 4th that he was stripped of his military and police security details, saying that he still has four security bodyguards. In a statement, Palace spokesman Harry Roque Jr. said that Philippine National Police (PNP) had only taken away the excess police personnel who are needed by the people most. “Per PNP, two were removed as he already had six when he’s only allowed four,” the spokesman pointed out. “Let’s allow our PNP to keep our communities safe, please,” he said. Trillanes, one of the president’s fiercest critics said on Friday that the Armed Forces of the Philippines (AFP) and the PNP had recalled his security details without any explanation. “The security detail from the AFP was also recalled. [Its] orders were not renewed and have expired since the end of June. Also, the Senate has not detailed any security personnel for me,” Trillanes said. The senator also said that he only now has former soldiers from the Magdalo group who serve as his security personnel. He added that Duterte can’t harm him, because he is a coward. “Subukan lang nila. Kilala ko ‘yang si Duterte by now. Duwag ‘yan [Just let them try. I know Duterte by now, he’s a coward],” the senator said. If recalled, President Rodrigo Duterte said in a speech during oath taking of the newly-elected barangay officials in Lapu-Lapu City, that he would not be surprised if Trillanes will be shot by someone because of his arrogance. 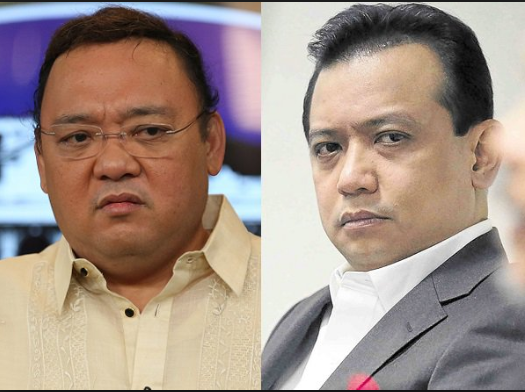 “Kahibaw ka na aning mga politiko nga sila Trillanes, nagpabilib pirmi. Mura’g siya ra’y isog. Pang-hadlok. Mura’g kinsa ba [You know how politicians are, like Trillanes. He is always trying to act tough and threatening and thinks he’s better than he is. ]” The chief executive said in Visayan language. “Mura pud siya’g magsalig siya kay kuan daw siya, Armed Forces, Navy. Kinsa ba’y mutuo niya? Sige’g pangaway, murag buang. Nagtuo siya nga siya ra’y isog. Mao na’y kadaot. Wa man gu’y nipatol. Si Paras di man pud mu… Kuan man na, usa ka adlaw, naa gyud mu mukasa gyud na ang bu naa gyud mukasa ana. Hambugero eh. Sige la’g paisog-isog [He feels confident because he’s from the Armed Forces, the Navy. But who would believe him? He’s always calling for a fight. He believes he’s the only one who’s tough because nobody’s paying him attention. But there will come a day that someone will shoot him because he’s arrogant],” the President said also in the Visayan language]”. The president also said in Visayan language.